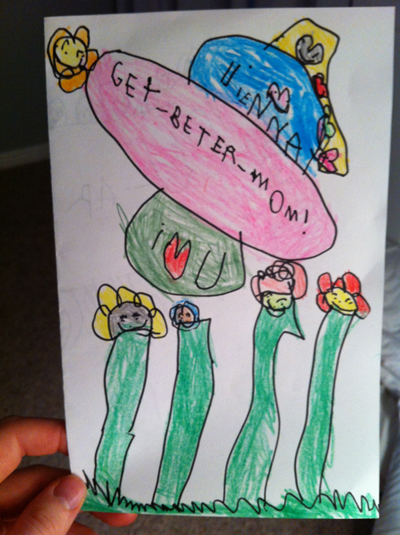 The only cool thing about being sick is the awesome get well cards my little V makes for me. I have a really bad case of strep the doctor told me today, I will see you on the flip side when I am feeling better. Is the a yellow submarine tribute! LOVE IT! Get well soon. I hope you feel better very soon! How could you not, with such a lovely card to cheer you up?!? That is no fun! I sure hope that you feel better soon. What a darling card! Strep is the worst! I hope you feel better soon! super cute artwork! feel better! my husband had strep last week. it was awful. let those antibiotics do their job and feel better soon! This is sweet. I used to be a Pediatric nurse, and my patients would sometimes give me stuff like this. It always melted my heart. oh man feel better friend!!! I love homemade artwork, I made by hand Valentine's Day cards for my family and they came out absolutely adorable. I may be a tad bit older than your child, but it's still the thought that counts. oh, this is very cute! i love the big stems on the flowers, and that they have faces. it must've made you feel better instantly. get well soon! Still sick? So sad! My daughter's doctor recommended warm apple juice; apparently it helps a lot with a super sore throat.